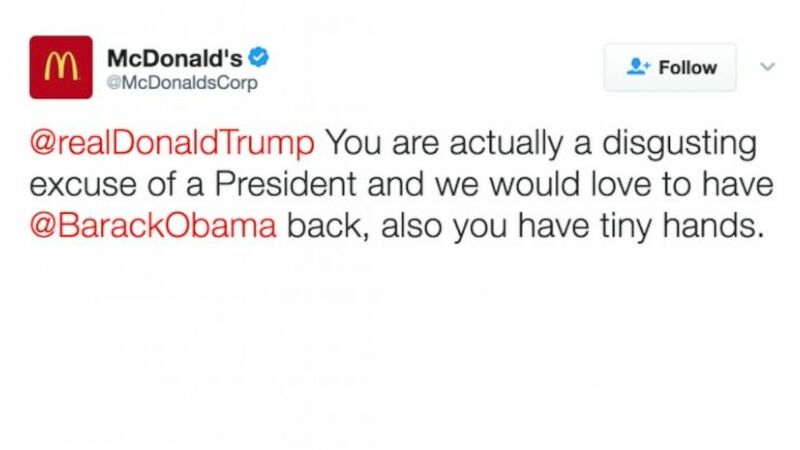 McDonald's confirmed Thursday night that one of its Twitter accounts was indeed hacked, after a tweet that called Donald Trump "a disgusting excuse of a president" was posted earlier in the day to its @McDonaldsCorp account. The McDonald's corporate Twitter account posted this at 9:16 a.m. ET on March 16, 2017. The tweet has since been deleted. The tweet was posted at 9:16 a.m. ET and was retweeted hundreds of times before it was deleted. McDonald's spokeswoman Terri Hickey said Thursday night that the company has determined a hack was the culprit. "Based on our investigation, we have determined that our Twitter account was hacked by an external source," she said. "We took swift action to secure it, and we apologize this tweet was sent through our corporate McDonald’s account." Initially, McDonald's said that the account had been "compromised" and that company officials were looking into the incident. "Twitter notified us that our account was compromised," Hickey said in a statement to ABC News about an hour after the tweet was posted. "We deleted the tweet, secured our account and are now investigating this." Twitter would not confirm to ABC News that it had communicated with McDonald's, saying only, "We do not comment on individual accounts for privacy and security reasons." Trump, who is an apparent fan of the fast-food giant, appeared in a McDonald’s commercial alongside one of the company’s mascots in 2002. He was also spotted chowing down on a McDonald’s burger and fries during the 2016 presidential campaign. The tweet likely kicked off a busy morning for McDonald's global chief communications officer, Robert Gibbs, who served as press secretary during President Obama’s first two years in office. ABC News' Daniel Linden, Dennis Powell and Rebecca Jarvis contributed to this report.